HEY APATHY! 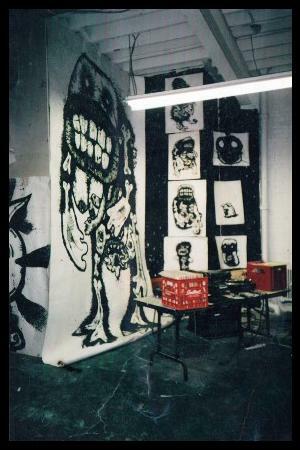 Draw Monsters and the Metropolis Spring 2004. The XPACE gallery presented the third major drawing installation by Mike Parsons. This exhibition presented a chronological re-visitation of the first two series (HEY APATHY! 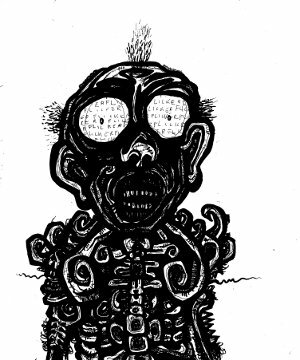 & the APOCALYPSE/HARD RAIN) and featured over 600 new monster drawings from the “Of pigs and Poverty” collection. The enormous gallery space was divided into three sections permitting the audience to move through the various collections like a larger than life story book. The exhibition started with a view of the city from a distance, then passed through the apocalypse and war zones ultimately ending up at street level, face to face with countless creatures and despairing denizens. Like all the major “HEY APATHY!” exhibitions the installation was planned as an all encompassing peripheral experience. The gallery was split into two major sections using a giant hand painted on bed-sheet sewn canvas with a constructed gallery hallway allowing visitors to pass between the rooms. The front half of the exhibit featured the large format metropolitan ink drawings from HEY APATHY! & the APOCALYPSE presented on red painted walls. The work depicted endless hordes of faceless denizens moving through tombstone like buildings coupled with explosively apocalyptic renderings of the city’s skyline. The corridor connecting the two major sections of the gallery was constructed of twisted red wooden panels featuring a small version of the “HARD RAIN” sculptural drawing installation. 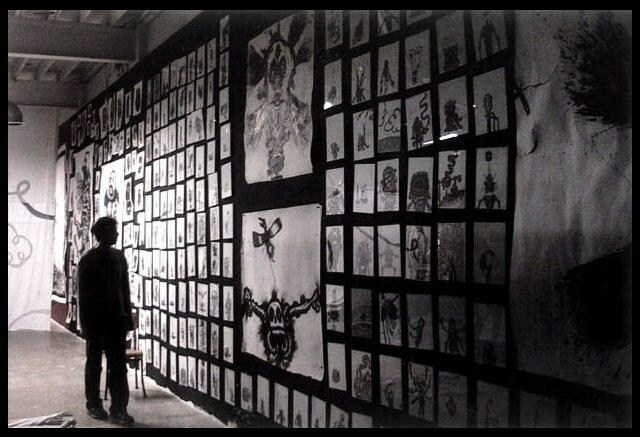 The disorienting and claustrophobic passage way led to the back portion of the gallery which was decorated by a 12 foot tall grid of skeletal creatures hung on despairingly black painted walls. 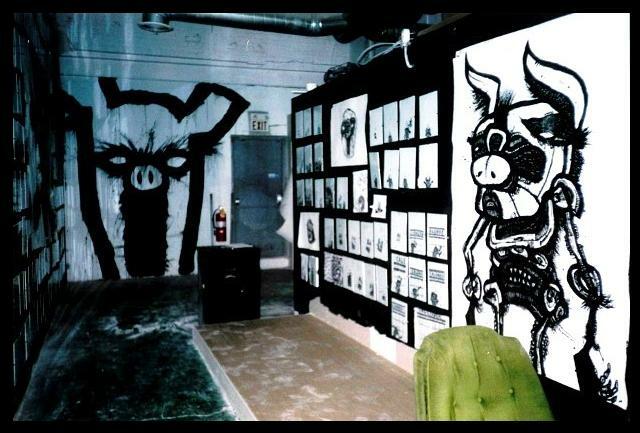 The back room also featured several graffiti style zombie pig creatures painted directly on the gallery’s exposed brick. The overall effect of the multiple themes and installation resulted in an intense transmutation of the traditional gallery space into a strange new and imaginary environment.